Elections today are plagued by vote splitting. When there are more than two candidates, similar candidates split their common supporters’ vote, possibly giving victory to a less-preferred candidate, even the least preferred! This happens sometimes (e.g. the 2000 US presidential election), but usually the mere threat of vote splitting is enough to force us to take preventive measures. Many of these mitigations are negative themselves, creating a cycle of pathologies. Fortunately, there is a simple solution: evaluative voting methods, where candidates are rated independently on a scale. Unsplit the Vote is a network of activists committed to promoting evaluative voting methods and ending vote splitting everywhere. Vote splitting and its consequences divide and polarize an electorate, leaving some bitter, others apathetic, and everyone cynical. People know that the environment is unhealthy, even if they cannot agree on the root cause. Candidate Dilemma: Candidates face a dilemma: to run or not? When candidates are numerous (more than two), vote splitting can cause a less preferred candidate to win. Candidates who are less known and less funded, not wanting to be a “spoiler” and knowing that most voters will not waste their votes, tend to stay out of the race, reducing competition and diversity. This often means the absence of a quality candidate who could have been the best compromise. Then again, maybe an extremist can enter the race and benefit from splitting between two moderate candidates. If candidates are many… Campaign spending is high, as candidates must spend vast sums of money to demonstrate their electability. Negative campaigning occurs among similar candidates, who should be natural allies, because they are competing for limited votes from the same faction. If candidates are few… Voters are disengaged, because the limited selection of candidates is unappealing, and they feel that their votes do not matter. Candidates are unresponsive, and turnout is low. Voter dilemma: Most voters, aware of the vote-splitting risk, avoid “wasting” their votes on a favorite but lesser-known candidate, in favor of their preferred among the seemingly “electable” candidates. However, some voters insist on voting for their favorite candidate, even polling data show that the candidate is unlikely to win. Results don’t reflect reality: Candidates, including the winner, end up with votes that do not reflect their true support (especially candidates who stayed out of the race entirely). Worst of all, in a spoiled election, vote splitting can cause a less preferred, even the least-preferred, candidate to win. 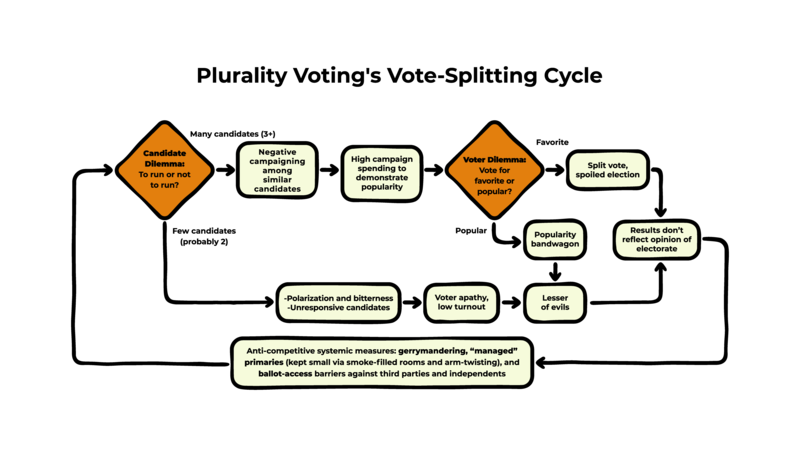 Anti-competitive systemic measures: Winning candidates engage in gerrymandering, raising ballot-access barriers, and taking other measures to further reduce competition and the future risk of vote splitting.